The Avid FX interface in Avid Media Composer. Originally I had intended to write about how I consider Avid FX (Boris RED) to be a lower substitute for Adobe After Effects. 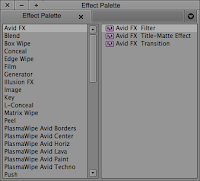 But as I prepared to write this blog, I decided to give Avid FX another chance and explore it further. After doing so, I've decided to change the direction of my blog and talk more about the advantages of using Avid FX. If you read my blog entitled "What I Like About Adobe Premiere Pro", you know that I love how Adobe Premiere Pro allows you to have Adobe After Effects comps directly in the timeline. Well, Avid FX is Avid's version of the Premiere / After Effects integration. All compositing can be done within the Avid timeline. There's no need for exporting and importing. 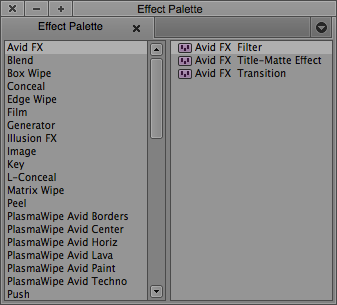 The effects in the Avid FX collection are not real-time and require rendering, just like with Premiere / After Effects. The Avid FX Filter is intended to be applied to a video segment or a filler segment. It looks down at the video tracks underneath it and uses those tracks in a composite. You can use up to six layers of video from your timeline. If you need more, you can bring them in once in the Avid FX interface. The Avid FX Title-Matte Effect lets you a manipulate and apply filters to a title or an alpha graphic without affecting the background. Keep in mind this changes a realtime title to one that requires rendering and once the effect is applied to a title, the text can no longer be edited. The Avid FX Transition is placed on a transition and allows the user to build custom transition effects. This is an additional advantage of the Avid FX integration - you can do either a segment or transition effect. 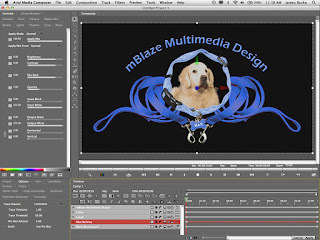 Premiere/After Effects doesn't allow you to do effects on a transition. 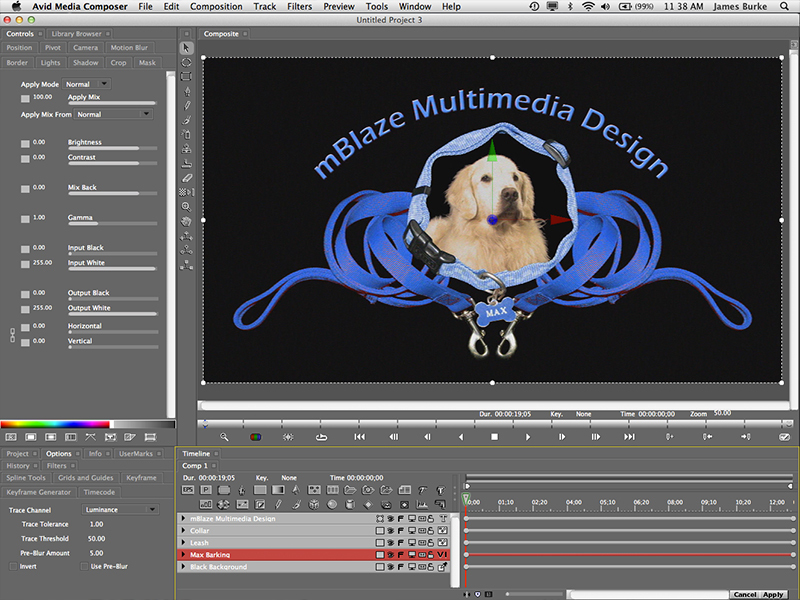 I have uploaded an Avid bin with a few of the transitions that I have created to a DV Fanatics Tutorial Link. A reminder from the first Avid Tips and Tricks blog - if you place these effects in a bin named "Quick Transitions", they become available to the Quick Transition button. Much like Adobe Premiere Pro switches over to the Adobe After Effects interface when editing an After Effects composite, Avid Media Composer switches over to the Avid FX interface when working on Avid FX composites in the Media Composer timeline. Using up to six tracks for Avid FX. Another great thing about how Avid FX works, is that you can keep all the tracks of a composition in the Avid timeline. This allows you swap out tracks used in your composite without going back into the Avid FX interface - something else that is not possible in the Premiere / After Effects integration. Avid FX can sometimes be frustrating if you're used to the way that Adobe After Effects works, but once you get used to working the way it does, it can be a very powerful tool. I love having an integrated compositing application within the Avid timeline, using the native Avid media (or AMA media). This is a big deal for media management. Tracking and managing sources is so much easier if all of them are contained within the Avid Media Composer - no exporting and importing. Below is my first attempt using Avid FX. Great ... I will try using it and testing in avid symphony ... but I believe that avid still need to improve the tools and interface and whole system in general like fcp what they did and ae also....this always happen with avid .... even rendering media.... avid is great but need to improve .... to become more faster. .. There's always room for improvement in any software. Damn, XD, that's good for a first attempt. Lol.